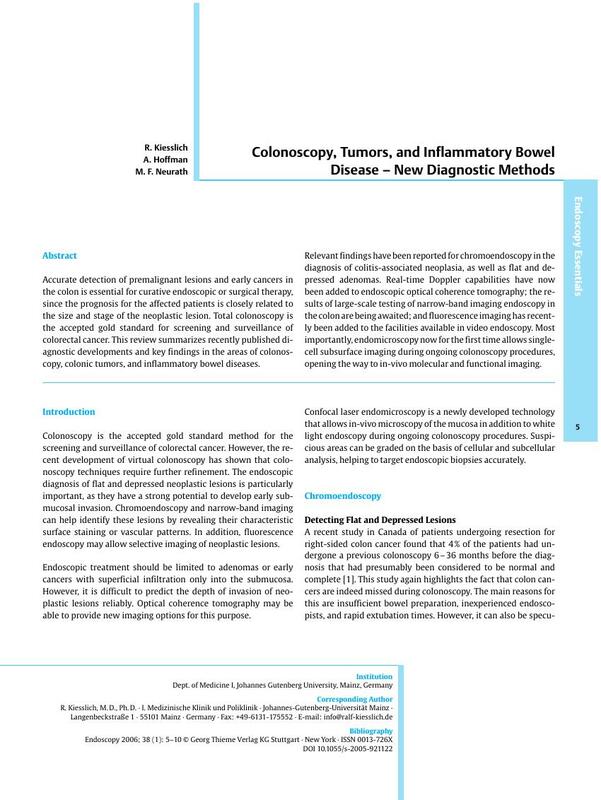 Accurate detection of premalignant lesions and early cancers in the colon is essential for curative endoscopic or surgical therapy, since the prognosis for the affected patients is closely related to the size and stage of the neoplastic lesion. Total colonoscopy is the accepted gold standard for screening and surveillance of colorectal cancer. This review summarizes recently published diagnostic developments and key findings in the areas of colonoscopy, colonic tumors, and inflammatory bowel diseases. Relevant findings have been reported for chromoendoscopy in the diagnosis of colitis-associated neoplasia, as well as flat and depressed adenomas. Real-time Doppler capabilities have now been added to endoscopic optical coherence tomography; the results of large-scale testing of narrow-band imaging endoscopy in the colon are being awaited; and fluorescence imaging has recently been added to the facilities available in video endoscopy. Most importantly, endomicroscopy now for the first time allows single-cell subsurface imaging during ongoing colonoscopy procedures, opening the way to in-vivo molecular and functional imaging.